Vroom vroom! If you’re ready to take your baby on the go but are unsure about what car seat will keep them safest and happiest, look no further! Here are our favorite car seats! The infant car seat is the first seat new parents buy. Most of these seats are installed rear-facing to ensure the best safety for children between 4 and 40 lbs, depending on the model. If you shuffle between multiple cars, this Chicco KeyFit boasts easy installation. It even has a built-in level to make sure you have correctly positioned the base. It is compatible with many different strollers and has an adjustable, multi-position canopy to ward off harmful UV rays to your extra sensitive infant. The 5-point harness and EPS energy-absorbing foam will keep your baby snug and safe for whatever adventure you go on! Around your baby’s first birthday is when you should be making the transition from infant car seat to convertible car seat. This seat can be installed rear- or forward-facing. These seats are often on the more expensive end considering they typically hold children up to 65 lbs. What the Boulevard lacks in portability, it makes up for in safety given its steel frame and extra layer of side-impact protection! It not only adjusts height but also has a 10-point harness that grows along with your child. It gives you an audible click when it is within range of proper tightness to let you know when your child is both safe and comfortable. When your child finally outgrows their convertible seat’s harness, it is time to transition into a car seat that uses the car’s own seat belt. Booster car seats essentially elevate a child so that the seat belt can fit them properly – across the sternum and the collarbone, and low across the upper thighs. There are two styles of booster car seats: backless and high back. Backless seats are much more portable and easy to install, but you lose the side impact protection and easier positioning of the shoulder belt that you get from high back seats. These seats can typically hold children up to 110 lbs. This 2-in-1 seat is not only a super protective high back model, but it also effortlessly converts into a backless booster when you are on the go and looking for something more portable! With 10 different heights and positions, the KidFit grows with your child. Head wings and shoulder “wings” offer optimal protection from the inevitable potholes along the way. Complete with armrests and duo cupholders, your child will be riding in style! Although all-in-one car seats can be tempting, Consumer Reports’ test have found that by having so many features, they don’t do any single task all that well. 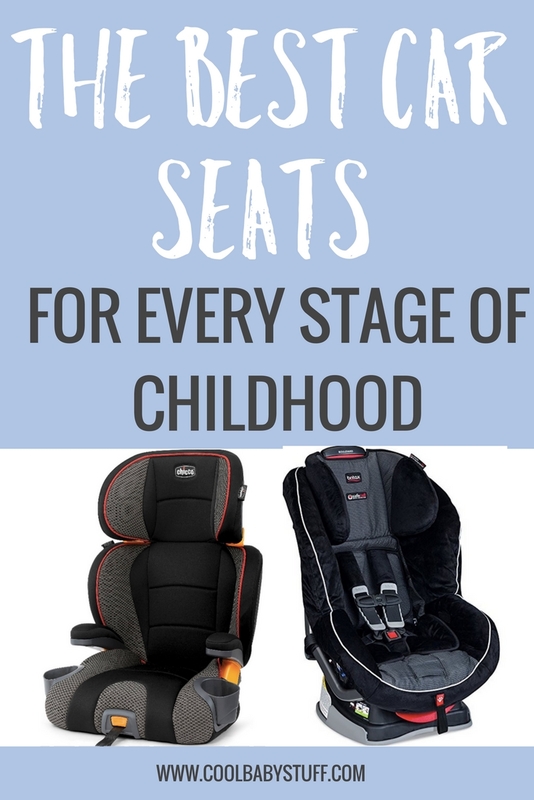 If you can afford to buy multiple seats or have a friend who is willing to lend you one during your child’s infant years, that is what is recommended to keep your child the safest. What are your favorite car seats? Leave a comment below!